food locally is preferable, undoubtedly there will be times when you just can't find what you need, or you just want something a little different. And that's ok (remember we're a guilt-free zone here), especially because some truly fantastic options exist for buying more natural and organic foods online that support small, independent producers and spread better, healthier food options to more and more people. So who's got what and where to start? Below are some Mavenjoy picks to whet your appetite. These natural and organic food retailers have got you covered with everything from field fresh produce, heritage meats, sustainable fish, and artisan cheeses to blueberry almond truffles and chipotle peanuts! They deliver the flavors and fare from "backyards" of communities across the country right to your kitchen no matter where you live. We've just updated our picks with new and old favorites -- all tried and true. 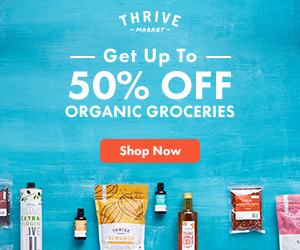 We shop them and come away with the best prices on our organic food staples + new product discoveries. So enjoy discovering the way-cool world of natural and organic foods online while meeting and supporting the good people that bring them to us. Save BIG with our best BULK deals for natural and organic foods too! Seafood and fish lovers, take happy heed: Vital Choice delivers BIG on freshness, flavor and nutrition with a superior selection of sustainably wild-harvested Alaskan Sockeye, King and Silver Salmon plus other seafood including shellfish (yes shellfish... shrimp, scallops, crabs and more!). You'll taste the difference because this is pristine fish from healthy, well-managed wild fisheries that is flash-frozen within hours of harvest. It stays that way until it is delivered to your door on dry ice with all its natural goodness intact. And we're particularly delighted that Vital Choice keeps expanding our choices for organic foods online with new twists on old favorites (like salmon sausages and salmon candy!) and new additions (like organic berries, nuts and extra dark chocolates!). But I would be so remiss if I did not call extra special attention to their extra special Alaskan Sablefish -- it's buttery and absolutely divine! Rest assured, this fish favorite is also listed as a Best Choice in the Seafood Watch Guide and is certified sustainable by the Marine Stewardship Council. Mavenjoy Tip: Save even more with our scoop on finding bulk value buys from Vital Choice and other organic foods too. Mavenjoy Extra: Enjoy 10% off your first purchase with Vital Choice by clicking here and using the code: VCAFINT during checkout. Use MAVEN15 for 15% off orders over $35! **Update** Abe's is now part of Direct Eats and carries over 20,000 organic and natural food and beauty products with FREE shipping on every order and no minimum purchase amount required! You can stock up brand favorites (like these) and also discover fabulous small makers and staff favorites too. Plus super deals on bulk buys! Mavenjoy Tip: Do you know a passionate natural food producer offering mind-blowing tastes and tidbits? Or maybe you're one yourself? Check out how Direct Eats can help small food producers and farmers go nationwide and sell their natural and organic food online with instant, high profile exposure. Mavenjoy Extra: For a limited time, our readers may use code MAVEN15 for 15% off orders of $35 or more. Vitacost has become one of our most frequented "go-to's" for vitamins, supplements and organic brands for food, household and personal care items. Vitacost's huge selection initially attracted us, its excellent customer service and recycling program won us over, and its outstanding prices and value keep us coming back. A real money-saver for products used all the time from natural and organic brands doing BIG good. They also have a huge variety of gluten free foods and beauty/personal care products. Also, Vitacost operates manufacturing, distribution and call centers located in neighboring North Carolina, investing much needed money and jobs into our region. Mavenjoy Tip: Vitacost's Set & Save makes it easier than ever to get your favorite natural and organic products locked in at the guaranteed lowest Vitacost price and automatically delivered when you want + free gifts, extra discounts and your 13th delivery free! A BIG time and money saver for the products you use all the time! Mavenjoy Extra: Get $10 off your first order of $30 or more by clicking here - thanks to VC's Refer a Friend Program -- you get $10, we get $10! It can prove a bit tricky to find local all natural meat sources like organic beef and organic poultry, right? So the fact that Heritage Foods USA brings a wide selection of sustainable meats to home chefs far and wide while maintaining a fierce commitment to family farmers would be enough. But their offerings go even further. They promote a completely traceable food supply and preservation of the natural genetics of a diverse food network. They do all this while staying faithful to the humane and ethical raising, transporting and processing of their products. You can choose from a variety of beef, poultry and pork selections or branch out and try a heritage turkey, rabbit and some bison too! And take the opportunity to meet the farmers behind Heritage Food USA's sustainable and organic foods online, you'll be awed and amazed at their unique stories and the care and skill they bring to what they do. Hooray! Indie foods from small producers for a bang-up alternative to mass produced food-like products. We're stoked about this source for small batch foods that are as distinct as they are delicious and packed with genuine passion by real people. Almost all the goodies are created in the United States without "chemical sweeteners, coloring, preservatives, or unhealthy fats" and always with a keen eye towards fair trade and organic ingredients. Cool shopping options that allow you to find and support proprietors in your region, meet your maker(s), or jump in with a subscription box...from pickles to chocolate, each and every month! And there are gluten free goodies too, like thin mint cookies -- yes those thin mints! markets and other local producers, another way to bring their food to all of us. At last count, they offered 8,197 crafts and natural and organic foods online and available via mail. Mountain Rose Herbs sells the purest, freshest quality organic herbs, spices, teas and oils that you can really see, taste and smell. Its unwavering commitment to organic standards from start to finish yields products that are guaranteed fresh, fragrant and colorful. Replenish your cabinet with Mountain Rose's spices, seasonings and salts and try out new and different butters and oils for whipping up your very own DIY recipes for everything from meals to your own personal care and home products.